Our expertise is unique allowing us to provide bolted joint training for Technicians and Engineers in the subjects. The combination of analysis, calculation and ultrasonic measurement provides us with a total picture of bolted joint performance. This allows us to make informed, considered proposals that deliver a 100% failure free plant. We provide Bolt Stress, Flange Stress, Tightening Torque, Tensioner Pressure and Gasket Seating Stress calculations for Mills, Pressure Vessels, Heat Exchangers, Slew Ring Bearings, Cylinder Heads, Structural Beams and Turbines. We design solutions that; improve joint alignment, prevent relaxation and provide intrinsic improvements. 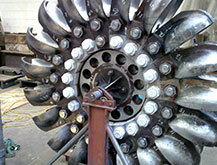 Grinding mills have critical fasteners that hold the structure together. If they have incorrect pre-load and loosen the ramifications are dire. Historically these bolts were torqued to 75% of the yield strength of the material. When you consider that the torque to tension relationship is normally regarded as + / - 25% it’s easy to see how they can easily be over or under tightened. Liner bolt failures are extremely common. These can cost production losses and be expensive to repair. 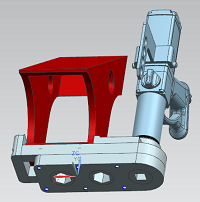 The drive mechanism relies on bolted joints to secure the boom to the drive motor. These bolts are clearly critical but often only torqued. The codes for heat exchanger designs allows Engineers to minimise flange geometry. This saves initial costs but leads to high failure rates. High multitudes (36-84..) of small diameter bolts complies and has adequate strength but leads to very high interactional pre-load losses when they are tightened, consequently they regularly leak. We measure each bolt to identify the "highs and lows". Adjust the "lows" (which normally reduces the "highs") and deliver an evenly tensioned flange joint. This ALWAYS results in long lasting leak free joints. 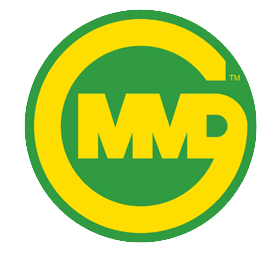 BP Oil, Shell, Chevron, Arco China, CSBP and many other process companies. Exciters that create the vibration for screens to work operate with very high "G" forces in the region of 3-5G. The bolts that hold these onto the structure are highly critical. Our solutions have eliminated failures that were originally occurring every 3-4 weeks. When a mine wanted to extend the period between maintenance strip downs we investigated the current bolt tightening performance. Our service controlled the bolt pre-load in critical areas, improved the safety and eliminated tension inaccuracies. We also provided defect detection during the assembly process. This information is used to INCREASE AVAILABILITY as are all of our services and products. Flanged Joint Management is now scalable, super-efficient and 100% accurate using the Verif.I.D. Automated Data Management System. Why do gaskets leak so frequently? We both ensure that all bolting is tightened to the correct level before going live and then offering on-going re-monitoring to analyse joint performance in service. 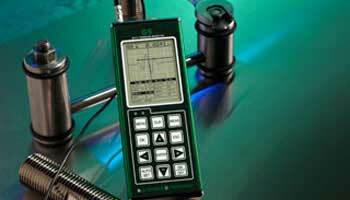 We can measure using any brand of Ultrasonic Monitoring equipment. "We get so much more than just ultrasonic skills from Trevor and his team"
"There is so much valuable information in the Boltstress reports, far in excess of any of the competitors"
"Boltstress guys need no supervision, they just get the job done in a quick, professional, safe and accurate manner"
"You're the best thing we ever found"
"We're so glad we could place the business with you, your support is so much better than the opposition"
"Trevor has been fantastic and we really value his input and vast experience." A simpler, lighter instrument that has the functions to complete most tasks. It is limited to bolts up to 2.5 metre's in length but how often do you come across anything longer ? Our consultancy service uses the combined strengths of our technology and practical experience to recommend solutions. Why do bolt failures occur and what can you do to prevent or address it? 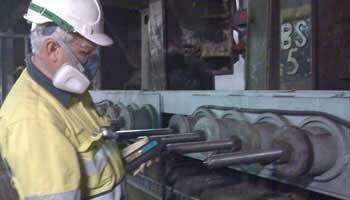 Most mill operators are familiar with (and regularly go through) a process known as re-torque. Re-torque is an expensive exercise resulting in lost production but is believed to be necessary in order to avoid bolt failure that causes unplanned shutdowns. It doesn't have to be this way however, by eliminating the root cause of the failures we can eliminate the need for re-torque all together. For the last ten years, our liner bolt specialists have worked with clients in need of diagnostics and solutions for problems with their mill liner bolts. One particular mine experienced an alarming one-a-week liner lifter bolt failure. Fast forward to today, Boltstress prides itself as being a dependable company with a highly competent maintenance crew that carries out ANY bolt-related works. In any business, time is money. This is why downtime caused by equipment failure and breakdown can result in hundreds and thousands of profit loss. Mining companies, for instance, rely on heavy machinery and equipment to keep their operations going. But what if machinery breaks down? How much is lost and what can be done to prevent this issue?